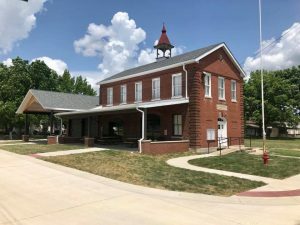 The newly restored and reopened Aviston Vintage Hall was among four projects honored as finalists for the 2018 Illinois Governor’s Cup, Nov. 20, during the annual Governor’s Hometown Awards ceremony in Springfield. In all, eight Metro East projects were among the 23 garnered Hometown Awards or honorable mentions during this year’s award program; held to recognize outstanding volunteer community improvement efforts. This year’s Governor’s Cup Award for the best community improvement project in the state went to the La Salle County Veterans Tribute Group for its work bringing the Vietnam Moving Wall — a traveling half-size replica of the Vietnam Veterans Memorial — to the county for a fundraiser. “The Governor’s Hometown Awards program gives formal recognition to communities that contributed to their community’s quality of life via projects that have strong volunteer support, met a need, and made a definitive impact,” the organization noted in announcing the awards. To qualify, projects must be sponsored by a local unit of government, enjoy strong volunteer support, meet an identifiable need, and make “a definitive impact, thereby generating a positive outcome in the community and by extension, the state. The program is administered by the Serve Illinois ​Commission, the Governor’s Commission on Volunteerism and Community Service. The finalist projects represented the best respectively in four categories of projects considered by the commission. The Aviston Vintage Hall — formerly known as the “old village hall” — reopened in June of this year as an event and meeting space; following a two-year, $45,000 renovation spearheaded by the Aviston Community Improvement Association (ACIA). Though originally established to conduct Aviston 150th anniversary celebration in 2014, the association quickly began taking an interest in other projects around town including restoration of the hall. Built in about 1905, and once targeted for demolition, the structure served as the village office building until the 1980s when deterioration prompted the village board and other users to seek other quarters. Funds for the restoration came in part from the association’s Aviston 150 5K run. The village acted as the general contractor for the project. Also named as finalists in this year’s governor’s cup competition: the Haunted Central Halloween attraction in the Chicago suburb of Lemont, and the Oak Lawn Community Garden in Cook County. Other Metro East projects winning Governor’s Hometown Awards this year follow. East St. Louis Township — East St. Louis Community Tennis Association-40 Days of Nonviolence Initiative — As part of its 40 Days of Nonviolence Initiative, East St. Louis Township partnered with the United States Tennis Association (USTA) to restore deteriorated tennis courts in Lincoln Park and offer free professional tennis lessons for children, teenagers, adults and senior citizens. Organizers now hope to expand the program and add partner organizations. Edwardsville — Growing with the Garden — After collaborating with the Edwardsville YMCA Early Childhood Development Center to design and develop three raised gardens in the facility’s children’s playground, Girl Scout and graduating Edwardsville High School senior Makenzie Keiser taught center students about the importance of vegetables in the diet. She then helped them plant, cultivate and harvest vegetables in the new gardens. The project won Keiser a prestigious Girl Scout Gold Award, the Girl Scouts’ highest honor; earned by only about 5 percent of eligible scouts. Edwardsville Township — Kelan’s Wheelchair Accessible Swing — Edwardsville lissencephaly patient Kelan Masinelli celebrated his 10th birthday in July by riding the new wheelchair accessible swing – named in his honor and installed at his parents’ request by Edwardsville Township with grants from the Make-a-Wish Foundation, Edwardsville Community Foundation and Edwardsville Junior Service Club. He celebrated his 10th birthday with a long-desired swing to have a Wheelchair Accessible Swing installed at the Boundless Playground. Lissencephaly is a rare, gene-linked brain malformation. 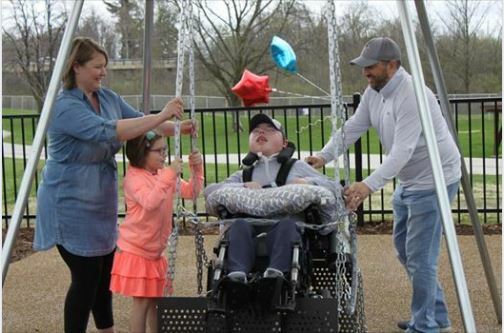 The wish was not only to fulfill his wish to be able to swing and play at the park, but for other children, with similar disabilities, to experience the same joy as him. The community volunteered its time and money to raise the additional funds needed to complete the project. Madison County — Beautification of Triad Middle School Student Courtyard — In another Girl Scout Gold Award-winning project, Katharine Housewright of St. Jacob enhanced the Triad Middle School Student Courtyard, largely unimproved since its construction in the 1960s, with colorful enamel paintings of a U.S. map and the Preamble to the Constitution on the courtyard pavement, as well as updated bike racks. Waterloo — Share the Feast — In 1991, the Waterloo Lions Club saw a need in the community to offer a warm, free, and complete Thanksgiving meal to those in need. It was prepared and served in a borrowed school cafeteria with dine-in, carry-out, or free deliveries. Share the Feast is an annual Thanksgiving Day meal, free to anyone wishing to join. It is organized and served by 30 volunteers that have dedicated 120 hours to ascertain event perfection. Various local businesses contribute by supplying paper products, turkeys, pies, and many other food and monetary donations. Though this was not created as fundraiser, the costs are usually always covered. Overages were saved as start-up money for next year. More than 300 free meals were served last year to those in need by the Waterloo Lions Club and community volunteers. Receiving awards in other parts of Illinois were projects in Aurora, Cicero, Hanover Park, Limestone Township, Morrison, Mundelein, Oak Brook, Royalton, and Urbana. ​​•Beckemeyer —Train Depot Restoration— After discovering the original Beckemeyer Train Depot (built circa 1900) abandoned in woods along the Kasaskia River (where it had been moved in the 1960s for use as a clubhouse), the Beckemeyer Community Development Club (BCDC) returned the historic structure to its original location and restored it. The restoration included a new roof, ceiling, walls, windows, flooring and exterior paint. Railroad tracks and a replica of a mailbag catcher were added to the front of the depot for historic authenticity. The depot’s original pot-bellied stove and safe, found elsewhere, that were used in the depot were refurbished and restored to their original places. O’Fallon —Nomenclature for Nature — In a third Girl Scout Gold Award project, Victoria Birchem of Fallon, cataloged (in a newly created database) and labeled all plants and species in the O’Fallon Community Garden. She worked with the O’Fallon Garden Club to coordinate tours of the garden and organized a garden tour program specifically for local Girl Scout troops. Projects in Harrisburg, Marion, and Stockton also received honorable mentions this year. In 2017, East St. Louis’ Join Hands Advocacy Project and Waterloo’s Monroe County House of Neighborly Service were finalists for the governor’s cup; with Collinsville’s Hometown Heroes program and Godfrey’s Beverly Farm Foundation also taking home awards.